Just One More Day until Digital Scrapbooking Day! We just have to get through Friday and all the Trick or Treating and then...it's Digital Scrapbooking Day! Digitally designed sneakers just for DSD 2008! Aren't they cute? Digital Sneakers! It's never too late to show you care with Flair. Get your own official DSD flair button. Come join us on Facebook too athe DSD event. Lots of fun things for DSD 2008. DSD 2008 Events - an ever growing list of fun things to do on DSD (November 1st). Keep checking it - there a new things being added every day. Digital Scrapbooking Magazine contest - make a header for their blog and see your name and work up in lights - okay maybe pixels. Winner to be announced on DSD so you still have time! DSD 2008 Flair is on Facebook - just use the search term DSD And you can have your very own button for your blog or whatever. Just download it - DSD Button. DSD 2008 shirts are for sale at Cafe Press. You can tell the world about digiscrapping and support a good cause at the same time. All proceeds will go to the NH Food Bank. And there are mugs and canvas bags and other good stuff too all with the design below. 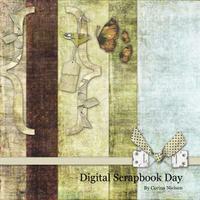 Memory Makers magazine is celebrating Digital Scrapbooking Day with a FREE kit! The November/December issue, which hits newsstands today, has a bit about DSD in their calender area. And readers may download a kit by Corina Nielsen at Funky Playground Designs which you see above. We used this kit for the header at the Digital Scrapbooking Day site so I can tell you first hand that this is one you don't want to miss. This is an exclusive kit only for Memory Makers readers so be sure and get your copy soon! You can even order it on line. Here's one ....water or liquid of any kind and digital cameras don't mix well. Don't store your water bottle and camera in the same bag. There is, of course, a National Scrapbooking Day (NSD) which has been around for a long time. Since the advent of digital, NSD has been celebrated in both the paper and digital world. So not having national in our name does cut down on the confusion. Then there is the international angle. Michelle Thompson, a digital scrapper and author of the enormously popular Scrapability blog pointed out that she was happy that we left national out of the name. After all, digital knows no geographic bounds and there are digiscrappers all over the world. Hopefully, the lack of the word national really tells it like it is - this is an international community and we have many (on line) friends all over the world. How cool is that? Okay..so maybe this is a little corny ...but I just think it amazing that we can bridge borders with digital scrapbooking. And that, hopefully, DSD is part of that.